Proximity ISO ID Card. F=125KHZ. Printable. Standard color : White. 200 Card Proximity ISO ID Card. F=125KHZ. Printable. Standard color : White. 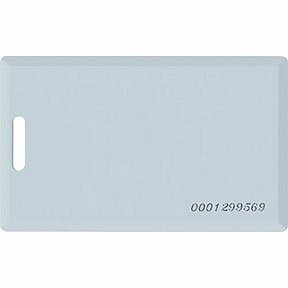 Mifare 1K ISO Card F=13.56MHz Printable PVC Dust proof anti-shock. Access control readers are vital for the security of your workplace to ensure that only trusted people can access certain spaces. You can order these at SF Cable. We have a range of products under this segment including Proximity clamshell ID cards, Proximity ISO ID cards, HID Proximity II ISO cards, RFID EM Key Tags in different keyfob colors, Mifare 1K ISO cards, RFID Card readers with different designs and specifications, Mifare IC readers with different built and specifications, Stand-alone Self Contained Access control Keypad, Stand-alone Self Contained Access control Readers, etc. All our products are sourced directly from the manufacturers which help us offer very competitive prices without compromising with the quality and safety of the products.